A Southern Grace: these spices have been nutted! There are several cons to this type of behavior, of course, but one of the foremost is that those suckers are EXPENSIVE. Nuts alone are costly, but when they're glazed, the price becomes exorbitant. So, I'm learning to pace myself, not only for the good of my waistline, but also for the good of my wallet. I first realized just how tasty candied nuts can be when I received a jar of them as a Christmas gift from my little brother and his little lady. They made the nuts themselves! After I had polished off that jar, I set out to buy some more, saw the price tag, and quickly changed my mind. Plan B was to make my own, but my first batch (made using a random recipe found online) just wasn't as good as that Christmas gift. Fortunately, my brother was happy to share his source for the recipe, and that is what I've posted below, with a few tweaks. Crunchy but not hard, a little bit salty and with a perfect amount of sweetness, I think you'll find that this recipe delivers an exceptional and addictive snack. In a large bowl, vigorously whip the egg white and water until frothy but not stiff, about a minute. Mix in the sugars, salt, and cinnamon, making sure there are no lumps. Add the walnuts and stir to coat evenly. Spread the sugared nuts in a single layer on the prepared cookie sheet and bake for 35 minutes, stirring occasionally. Remove from the oven and separate nuts as they cool. They may want to stick to the foil, but don't let them. When completely cool, pour the nuts into a bowl or plastic ziplock bag, breaking up any that are determined to stick together. Candied nuts are definitely a sweet indulgence we can make at home. I am such a sucker for nuts! These look like really good ones with a nice layer of flavours. I would have the same problem with candied nuts! They would not last long, and I would be 5-lbs heavier (smile). Good that you have self-control and can pace yourself. Ooooh, these sound SO good. Don't think I could stop! 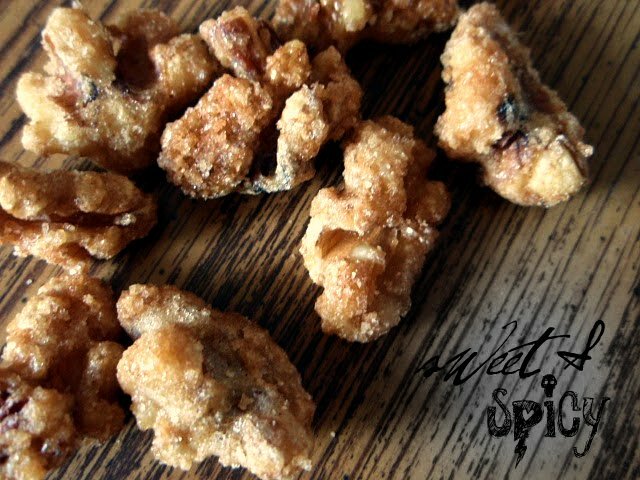 I love candied nuts and I like adding chili powder to mine and they are a wonderful treat! Yes Grace...I am totally addicted to these kind of nuts. I do love these things! They are totally addictive and I tell myself they're good for me because they're nuts, right? I, too, can eat a bag of these if I don't have someone to stop me! They are perfect! Not a sweet nut eater...but my daughter is. She loves them. Definitely will try this when next she comes home. I can't even be alone in a room with candied nuts because I love them so much!!! Oh sooo good looking. I too would not stop until the bag was empty. Unfortunately I have a serious allergy to nuts, so will have to wait til my next life time to try this one!!LOL! I absolutely love candied nuts but have never made them. These look great! Oh boy, I'd love these. In fact I just finished a handful of raw almonds.....I must make your version with the remainder... Very yummy Grace! Candied nuts are a real treat! And so easy. I like a little chili pepper in mine. I agree, I love candied nuts. BUt I always have to add some heat to them. Have you tried the sweet & spicy pecans from Trader Joe's? So good! I'm with you girl. I have no willpower with candied nuts or peanut butter. I'm on the same page when it comes to candied nuts. I haven't yet made them because of the fear of how dangerous it will be for my waistline...but I just need to do it. My credit card begs me. Yum. I love them in salads.